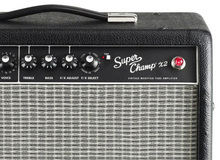 Koch Jupiter 45 - "Ampli, mais pas que..."
Koch Jupiter 45 - "Simplement F A B U L E U X !!!" Koch Jupiter 45 - "L'ampli ultime !" Laney LV300T - "Laney LV 300 twin"
Fender Performer 1000 - "Très bon ampli"
Fender Roc Pro 700 - "Son typé"
Music Man 210 Sixty-five - "LITTLE BIG AMP"
Music Man 212-HD One Fifty - "musicman 212 150"
Marshall VS100R - "Old School"
Marshall 8040 ValveState 40V - "Arfff ... le son marshall TRASH 90's, qui passe ou qui casse !"